Course of Ganga river in Uttarakhand | Origin of River Ganga | Panch- Prayags of Uttarakhand |Places from where the Ganga river passes through in Uttrarakhand | Uttarakhand adventure guide | Nainital Travel Guide | Uttarakhand Travel Guide | Travel guide & Adventure guide in Nainital. Ganga is a divine river of India, it has a great significance among Hindu religion followers, Ganga river has been given the title of Mother and is worshipped like a Mother by Hindus. 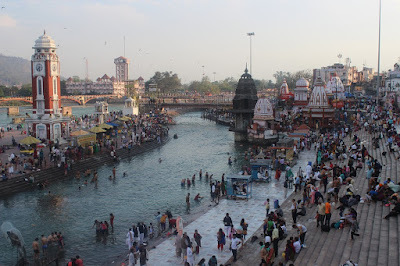 It is believed that Ganga is one of the most ancient river of India and whoever takes a dip into the holy water of River Ganga gets absolution from all the sins one has committed in the past. That's why it has great cultural significance among the Hindu religion followers. People keep Ganga water with them at their homes and use that water in religious ceremonies or drink or sprinkle that holy water in their body to purify themselves because people in India consider Ganga's Water as the most pure water in the Earth. Scientists also has proved that Ganga's water has self purifying properties. Ganga river is the lifeline of North India, during its course of 2700 km it provides water to more than 40 crore peoples of India apart from this the Gangetic plains are home to variety of flora and fauna, Dolphins, Ganges shark, crocodile are some them. At first River Alaknanda originates somewhere from Satopanth and Bhagirathi- Kharak Glacier in the Chamoli district of Uttarakhand. Then the Alaknanda river meets with Saraswati river at Mana, 10 kms away from the holy town Badrinath (one of the Dhams of famous Chardham). After flowing around 30 kms down the hilly slopes of Badrinath it meets with Laxman Ganga at Govindhat in Chamoli district of Uttarakhand. After some kilometers of flowing it meets with Dhauliganga river ( originates from Niti pass - Chamoli) at Vishnuprayag in Chamoli (one of the Prayag of Panch prayags). Then it meets with River Nandakini at Nandanprayag ( the other prayag) in Chamoli district of Uttarakhand. This river is still known by the name of Alaknanda. After meeting with Nandakini it meets with River Pindar at Karnaprayag ( the other prayag) in Chamoli district of Uttarakhand. At rudraprayag ( one of the prayag of panch prayags and also one of the district of 13 districts of Uttarakhand) River Alaknanda meets with River Mandakini ( originates from Chora bari glacier of Kedarnath). Finally Alaknanda river meets with River Bhagiratahi ( originates from the foot of Gangotri and Khatling glaciers at Gaumukh in Uttarkashi district of Uttarakhand) and from here it is known by the name of holy river Ganga. Meet of Alaknanda river ( in the right) and Bhagirathi river at Devaprayg.